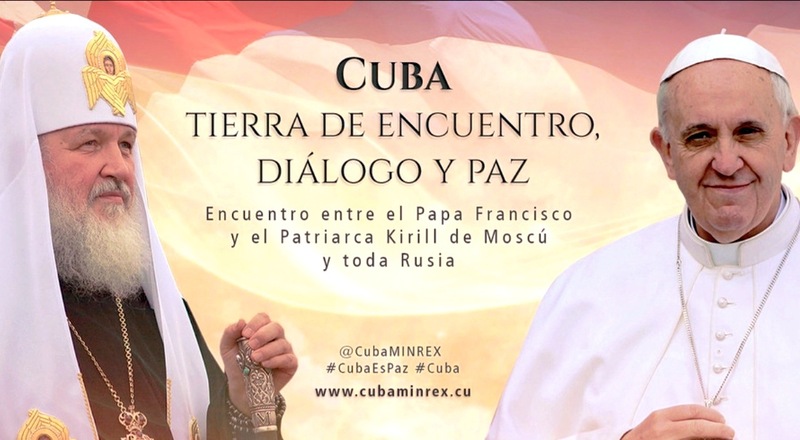 Friday’s encounter in Cuba between Pope Francis and Patriarch Kirill of Moscow and All of Russia marks the first time in history that a Pope and a Patriarch of the Russian Orthodox Church meet face-to-face. Peter Humeniuk, Russia expert for international Catholic charity Aid to the Church in Need, talked Feb. 9 about the significance of the encounter, a major step forward in the dialogue between the two Churches, which ACN has been supporting for more than a quarter century. With more than 100 million members, the Russian Orthodox Church is the largest and most influential of the Orthodox Churches. Its voice carries great weight. Why is the meeting of these leaders happening right at this particular moment? Peter Humeniuk: It’s due to the dramatic international situation. We are witnessing the persecution of Christians to an extent that has never been seen before. When the world is on fire, individual issues pertaining to ecclesiastical politics play a subordinate role. Bearing witness together is more important than ever before! Humeniuk: Reactions have been positive, as was the response of the major media outlets; you constantly see pictures of the Pope. It sent a very good signal that the Holy See and the Patriarchate of Moscow announced the news simultaneously. The meeting is also seen positively within Orthodoxy. Patriarch Bartholomew, the Ecumenical Patriarch of Constantinople, received the news with great satisfaction. Humeniuk: The meeting is therefore a culmination of what has been achieved up until now, the fruit of a work that has been in progress for several decades. There have already been many occasions in the past when both Churches have spoken with one voice. One example I would like to mention occurred in September of 2013, when Pope Francis and Patriarch Kirill raised their voices in support of peace in Syria. At the time, Patriarch Kirill wrote to President Obama, Pope Francis and President Putin. It is to be expected that the cooperation between the two Churches will become deeper and more intense following the meeting. This meeting is of course an incentive and a confirmation to continue along this path of dialogue. There is also a mutual search underway for new forms of cooperation, which should manifest themselves in new projects and joint campaigns. Important spheres of activity are opening up, in addition to standing up together against the persecution of Christians, there will, for example, be initiatives in support of the Christian family. There is much to do here and both Churches have demonstrated a strong willingness to search for solutions together and to bear witness together. And in view of the international situation, the Churches can only make themselves heard by raising their voices together—and put forth a cry for peace.